Pink Brick . Brick would look better if he wore pink and had pink eyes, that way Blossom would love him more, since Real Men Wear Pink. 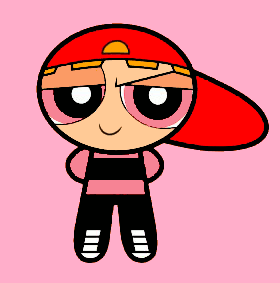 The red baseball cap was retained to be a mirror to Blossom's red bow.. Wallpaper and background images in the Powerpuff Girls club tagged: brick blossom powerpuff rowdyruff powerpuff girls ppg pink.